Friends recommended The Clambake to us. It was wonderful. I had the crab cakes. They were great. The crab claws were so fresh. We had them scampy style. They are a must have. The lobster bisque and clam chowder were both very good. The staff is warm and efficient. It’s on our must visit list. The best New England seafood around!! Fantastic chowder and fried clams and the best hot dog rolls!! Having grown up in New England, and transplanted to SWFL over 20 years ago, I still insist that the taste of New England seafood still beats any seafood I have tried! I love the Clam Bake Restaurant and have converted several friends to love it too! Try the oysters, haddock, clams, steamers, perfectly cooked lobster and the best New England clam chowder in town if you get a chance! Heck its all good, so keep going back to cover the whole menu! RJ & I heard about the Clam Bake while shopping for clothes at Dillards. We mentioned that we were going to go have lunch at a different seafood place. Two of the salesmen we were dealing with both said we should stop in The Clam Bake. Both RJ and I are from New York and WE LOVE SEAFOOD. After looking at their menu we knew we were back in the Northeast. For lunch we had fried clams and clam chowder. Both were great. Then after talking to Laurie (one of the owners) she brought us a sample of the lobster bisque. Wow, that was "spot on". As good and ANY I had ever had back East or anywhere else. Anyway, if you love seafood there is NOT ANOTHER restaurant in this area that will compare. 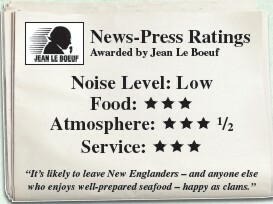 Trust me, we know seafood and we know New England Seafood. This is the best! !